Photo of Nacote on 4/8/2016 by Kelly Hunt. It’s always a wonderful sight to see a bald eagle soaring up in the sky or perched in a tree. Today, if you live in South Jersey, the chances of seeing an eagle are pretty good. When I first began working with the New Jersey Bald Eagle Project in 2000, there were 25 nesting eagle pairs in New Jersey. Today, the State Endangered and Nongame Species Program along with Conserve Wildlife Foundation are monitoring over 160 pairs throughout the state! Needless to say, the eagle population is doing very well due to the recovery efforts and the team of dedicated New Jersey Eagle Project volunteers and supporters. Today, there are seven known nesting pairs of eagles in Atlantic County. The longest residing pair in Atlantic County is the Galloway pair. Since 1996, the pair has raised and fledged a total of 29 chicks. During that time, the pair has moved their nest twice and the adults in the pair have most likely changed. Though eagles do mate for life, when one in the pair is injured or killed another is waiting to take it’s place. Jack Connor is one of our dedicated eagle project volunteers and has been monitoring the Galloway pair since they were first discovered in 1996. He has an intimate knowledge of this pair since he is out monitoring them every week during the nesting season. He has experienced the joy of seeing a chick(s) in the nest and the thrill of getting to hold one of those chicks at a banding. But he’s also had disappointment when a nest fails, which can happen during incubation or after hatching. In 2009, the nest collapsed and the two chicks didn’t survive. He has witnessed the determination of these birds to come back year after year. In 2014, the chick at the Galloway nest was outfitted with a transmitter. This allows us to follow his movements after leaving the nest. The bird named ‘Nacote’ has been to Canada and back. He is now in Atlantic County and was spotted at Forsythe National Wildlife Refuge in April. Eagles reach sexual maturity at five years of age, so he has a few more years until he’ll start nesting. To follow Nacote’s movements, visit our website. On April 8th, Kelly Hunt was photographing four bald eagles at Forsythe National Wildlife Refuge (NWR), two adult birds and two immature birds. When she got home and looked at the photos she realized that one of the young birds was banded and had a transmitter. It was “Nacote” back in his home area. “Nacote” was banded and outfitted with a transmitter on May 6, 2014 at the Galloway nest. Since then we have been tracking his movements on the CWF website. These photos give a great look at what the plumage of a bald eagle going into its third year looks like. You’ll also notice that the eyes and bill haven’t yet turned yellow. January 2015 is the Month of the Eagle! CWF is kicking off the new year by celebrating all things eagle. Follow us on social media and be sure to check your email (sign up for our list) for weekly stories on these amazing raptors from our own eagle biologist Larissa Smith. Larissa, a wildlife biologist who has been working for Conserve Wildlife Foundation since 2000, coordinates the New Jersey Bald Eagle Monitoring Project. Conserve Wildlife Foundation of New Jersey (CWF) today released the 2014 Bald Eagle Report, highlighting the number of nesting pairs, active nests and nest productivity for the raptors throughout New Jersey with data collected by New Jersey Department of Environmental Protection Division of Fish and Wildlife biologists, CWFNJ biologists and dedicated volunteers. Two young bald eagles were fitted with GPS tracking devices (wearable backpacks) in Summer 2014 to conduct a telemetry study to better understand raptor behavior. View the complete Bald Eagle Project Report online. ENSP biologists chose one eagle from Atlantic County (a male nicknamed “Nacote”) and one from Cumberland County (a female nicknamed “Millville”) to be tagged in this telemetry study. Nacote was in Canada until mid-October when he started heading south. He visited Six Flags Great Adventure in December and for the past two weeks, he has been residing in northeast Atlantic County, especially Edwin B. Forsythe National Wildlife Refuge. Millville ventured out to Delaware Bay marshes in late July and back in early August. In mid-September, she crossed the Delaware River into Delaware and then spent most of September along the Chesapeake Bay in Maryland before crossing over to Virginia. The federal government removed the bald eagle from its list of Endangered Species in August of 2007, but the bald eagle’s official New Jersey status remains state-endangered for the breeding season and state-threatened for the non-breeding season. The Division of Fish and Wildlife’s Endangered and Nongame Species Program (ENSP) bald eagle recovery efforts, implemented in the early 1980’s, have resulted in a steady recovery of New Jersey’s bald eagle population. ENSP biologists, Conserve Wildlife Foundation of New Jersey staff, and volunteer observers continue to locate and monitor bald eagle nests and territories each year to analyze the state of the population. 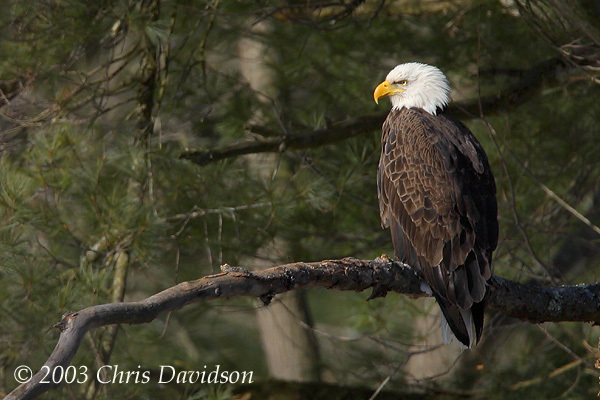 The population of wintering bald eagles has grown along with the nesting population, especially in the last ten years. This growth reflects increasing populations in NJ and the northeast, as each state’s recovery efforts continue to pay off for eagles. This season, 25 new eagle pairs were found. The statewide population increased to 156 pairs (including nesting and territorial) in 2014, up from 148 in 2013. A total of 156 nest sites were monitored during the nesting season, of which 146 were documented to be active (with eggs), up from 119 last year. One hundred fifteen nests (79%) of the 145 known-outcome nests produced 201 young, for a productivity rate of 1.39 young per active and known-outcome nest. The Delaware Bay region remained the state’s eagle stronghold, with 43% of all nests located in Cumberland and Salem counties. 2014 marked the first year of successful eagle nesting in the Palisades Interstate Park in perhaps 100 years. The telemetry study, in tandem with the most recent annual eagle report, has been illuminating. For maps of the movements of Nacote, updated regularly, visit our Eagle Project page.